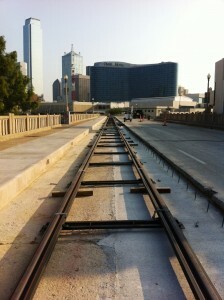 The oakcliffblog.dallasnews.com site reports that the first rails for the Oak Cliff modern streetcar appeared on the Houston Street bridge on September 12, 2013. Steel crossties are used to connect the 680-foot long welded strings of rail. The rail right of way is next to a newly widened sidewalk designed for pedestrians and cyclists. After the rails are levelled they will be encased in concrete. The 1.6 mile line is due to be complete by October 2014, although opening may be delayed until early 2015 if the line's two streetcars are not delivered in time.